Leia's near-death experience in Star Wars: The Last Jedi may have divided fans, but at least now they can witness the scene from the perspective of General Organs herself. That's thanks to the comic book adaptation of Episode VIII from Marvel, retelling the events of the Star Wars movie. With Star Wars: The Last Jedi #2 the comics have already added a handful of details and new hints of canon to the film's depiction of events. Now in the case of Leia's involuntary spacewalk, fans have the opportunity to hear the thoughts that crossed her mind as audience members sat stunned, unaware of Leia's future in the series. And trust us, it's just the perspective fans of the indomitable, quick-witted Leia will want to enjoy. As most would expect from an adaptation, the sequence of events leading up to Leia's brush with death (and first major use of The Force) follow those depicted in the film itself. That is, the surprise attack of the First Order led by Kylo Ren and two fellow TIE Fighter pilots. The attack run that sees Kylo-- sorry, Ben and his mother, Leia, connect passively through The Force. No words are spoken, but the bond is enough to turn the fallen apprentice from murder. Which allows the other pilots to pull off the attack, launching direct hits on the Resistance vessel's bridge. Thankfully, the comic book version also punctuates that disaster with a moment Star Wars fans will probably wish had made the actual movie. That's right, writer Gary Whitta and artists Michael Walsh and Mike Spicer actually show the last words of Admiral Ackbar, a fan-favorite leader of the original Rebel Alliance whose unceremoniously death was a disappointment for many Last Jedi viewers. After all, leading the Rebels to victories in both A New Hope and Return of the Jedi (in which his famous "it's a trap" line was uttered), not to mention The Force Awakens probably earned him a fitting death. For many, being briefly seen as one of the many officers killed in a fiery instant was less than hoped for. Hopefully, the single moment of acknowledging his coming fate, and using it to address his fellow Rebels with honor will better meet expectations. Still, it's the fate of General Leia Organa that proved far more of a talking point when Last Jedi was first released. Not that she survived the attack at all, even if the loss of Carrie Fisher made the presumed death scene even more meaningful. No, the controversy came when Leia seemed to instinctively call on The Force in her final moments of life to open her eyes, outstretch an arm, and propel herself through the vacuum of space and back onto the ship. A moment that can now be better understood, and the truth of it shown from Leia's actual perspective and narration. Leia's internal monologue may be more accurate, since the text boxes accompanying the images show her mind was still functioning while adrift in space. If not her mind, then her essence or awareness in the larger Force (the metaphysics of the Star Wars universe are hard to describe). The point is: Leia was conscious of her coming death, and in what she believed to be her final moments, attempted to search The Force for some vision of her future, if not guidance. And what she saw inspired her to move into action. RELATED: What Was Leia's Original Star Wars 9 Role? This insight into Leia's space scene should be read a number of ways by fans trying to predict what Leia's story will be in Star Wars: Episode 9 (and how much this use of The Force will ripple outward). For starters, that her words at least imply another Force Vision added to the Star Wars canon. Leia claims that Luke was told her The Force may grant its users insight into the past or present of all things, but that the future was not set in stone. A nice touch, since it was Yoda who first taught Luke that lesson in The Empire Strikes Back. Anakin was deceived by his vision of Padme's death, while Luke saw his friends in jeopardy. Now, we can add Leia to the list. The comic doesn't show or dictate just what Leia saw when reaching forward, but whatever it was reignited her rebellious spirit. That alone makes the scene far less confusing, since it was unclear just how "present" Leia was in the sequence. Now the only question is whether the future she saw for herself was merely one that survived, one that saw her reunited with her lost brother, or one stretching even farther into the future. Force Visions have famously shown heartbreak or a potential "fated" moment. 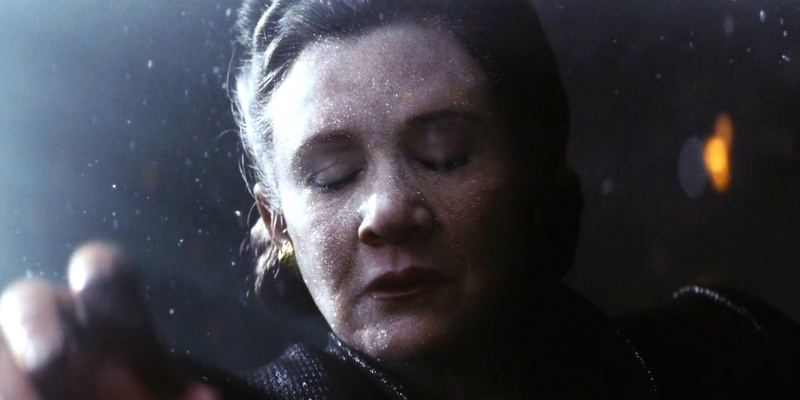 From Leia's reaction, she saw something she needed to live to see, or perhaps personally make possible. Lessons she would bestow upon Rey before the next film, or guidance given to help make Poe Dameron a true leader should be likely theories. But that answer will only be given in time, when Star Wars 9 hits theaters - if it's ever revealed at all. Star Wars: The Last Jedi #2 is available now from Marvel Comics.